Not expect us to have spare parts – this is not a free a repair shop, it’s a pop-up community event! If you want to come it would be useful for us if you can book in advance, but you don’t have to. Donations are welcomed but not required to sustain the local Restart Group in the long term and make it accessible to all. Leicester Fixers is a community of problem solvers - amateur and professional repairers and non-repairers - that work together to mend the broken and learn more about repairs. Every four to six weeks, usually on a Saturday, we run community repair events called Restart Parties where anyone can come to get help to repair a range of items. These events are entirely run by volunteers and are free to attend. However, we encourage donations to ensure we can keep running repair events in the future. We also meet every Tuesday for Open Hacknight at the Leicester Hackspace and provide support to people who need their items repaired and contacted us directly through our Facebook page. We participate in online, local, regional, national and international conversations to inspire repair practices, encourage consumers to buy for longevity and to reduce the numbers of items going to landfills. In fact, if it's broken, feel free to bring it along! We can have a go at fixing it together or at the very least, advise and provide suggestions on what your best course of action might be. We only ask that you let us know prior to the event via our Facebook page or by email so we can do a prior assessment before the event. Also, for 2018/2019, we are excited to be delivering the Leicestershire Outreach Programme, an initiative funded and supported by Leicestershire County Council. We are reaching out to six communities across the county so they too can self-organise to bring repair events to their community. We will provide the tools, the skills, the training and the insurance for your community to run repair events. So, if you live in any of these areas - Loughborough, Coalville, Hinckley, Uppingham, Market Harborough, Melton Mowbray, Lutterworth - or know someone who does and would like to find out more then get in touch with us now! You can also join the Facebook Groups associated with each area to start the conversation about how to repair our everyday items. 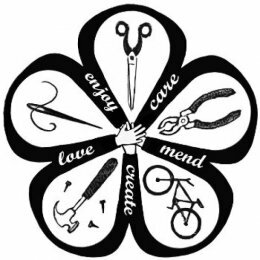 Be the person who helps to make community repair events a feature of their community, someone who inspires the people living in their local area to mend their broken items and one who helps reduce the items going to landfill. We can't wait to hear from you!